Finding a family-friendly resort can be a little trickier than one might imagine. You have to make sure it has enough activities to keep the kids happy while offering you and your partner some time to enjoy one another’s company, too. For kid-friendly activities, on-site spas, mini golf, and more, check out the best hotels and resorts for families in Texas! South Shore Harbour Resort is “the largest full-service waterside resort and conference center in Southeast Texas.” The resort sits on Clear Lake and boasts over 230 rooms. Enjoy the on-site amenities for the ease of access to Clear Lake for kayaking, canoeing, and more. Log Country Cove offers families easy access to LBJ lake, horseback riding and drag boat racing. Rent watercraft on-site and head right outdoors, where the lake awaits. The log-cabin rustic charm will keep the kids talking about this trip for ages. Cibolo Creek Ranch is known as a wonderful fishing destination. If your kids enjoy fishing for perch, catfish, and largemouth bass, then this could be the perfect spot. Located right along the lake at El Cibolo, the on-site spa gives parents something to do, too. The Antelope Lodge is a 1950s-style “motor court hotel set in the beautiful mountain valley of Alpine, Texas.” What the lodge lacks in luxury it more than makes up for in history. Exotic. Resort. Zoo. Get ready for trips to the petting zoo, for guided tours. For safari cabins. There’s not much more we can say—why an exotic zoo resort would be the perfect fit for a family seems self-explanatory. It’s a dream come true. The Willow Point Resort in Buchanan Dam, Texas, offers wonderful fishing, water sports, hiking, and more in a tranquil environment. Escape from the hustle and bustle of daily life and enjoy one another’s company with special offers, available on their website. Mill Creek Ranch Resort has an RV park, cottages, tiny houses, and lodge, in addition to their main resort. According to their website, they “aim to be a different kind of cabin resort,” with “first class amenities, gracious hospitality and a belief in the preservation of our natural resources.” You’ll love it so much you’ll consider purchasing one of the cabins so you can come back and stay. The Hideaway Ranch and Retreat in Glen Rose, Texas is a superb spot for family bonding. Situated on 155 wooded acres, families are invited to “sit in a hot tub, ride a horse, fish, hike, stargaze, swim, or just relax!” What more could you want from a family vacation? Lone Star Jellystone camp and resort was made for families to enjoy time together. They’ve got a ball pit, basketball court, stocked fishing lake, mini-golf, water slides, pools… in the biz, we call that the works. The Gaylord Texan Resort and Convention Center is massive. It truly embodies the “bigger is better” mentality that defines Texas. 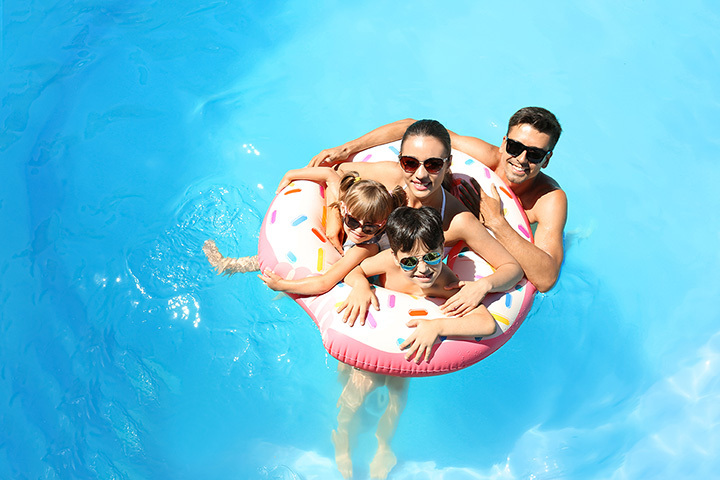 Families will love the seasonal water park, ten restaurants, pools, and more. It is well worth the splurge.